Hey everyone. I rarely share personal stuff here but this is a huge project that I have been working on these days rather than stamping. 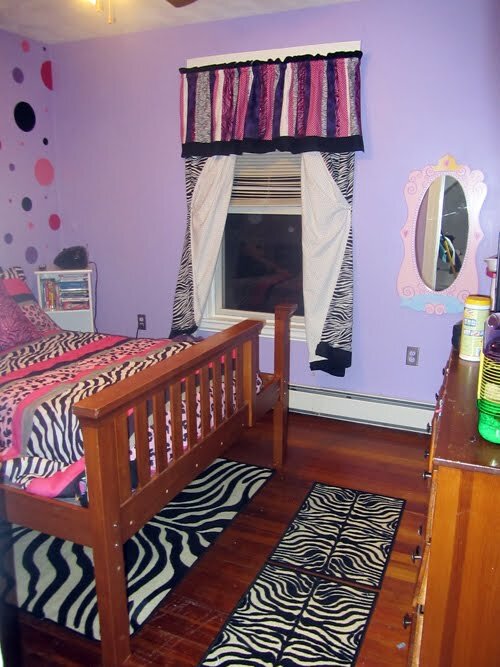 I had a huge itch to do something different so I decided to redo my daughters bedroom and make her curtains. I was going to make the comforter too but it was so much easier to buy it. I did make two pillows for her bed though. 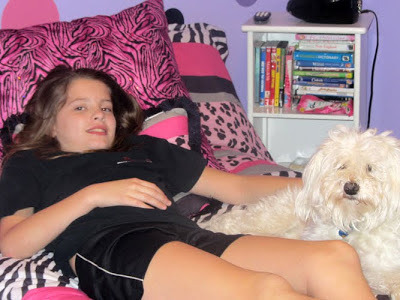 This was her bedroom a year and a half ago. It killed me. 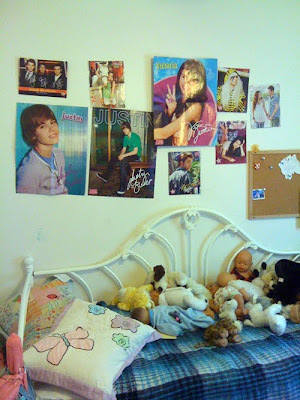 Boys on her walls and baby dolls on her bed. Then we decided a loft bed might give her more room. We were wrong. It was a cluttered mess. I painted all the walls and the woodwork. It's a really pretty light purple. I should say that I am NOT a fan of purple at all. I always dreamed of having a little girls room done in pale pink and yellow. Yeah, not with my daughter. Her bed is still the loft bed for the moment. We cut it in half. We couldn't fit it up the stairs so my husband sawed it off, drilled holes and stuck steel rods in it so that it was sturdy when put back together. 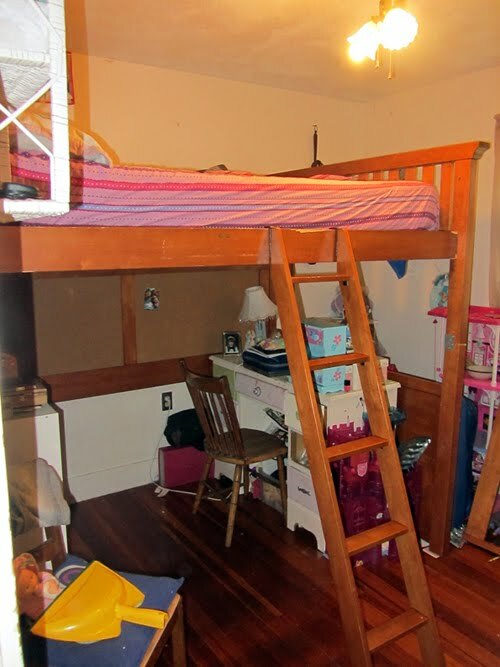 Our boys bunk beds are like that. We thought it was genius when we bought it. It worked great for her bed too and now it works as a regular bed. She is getting a white Captains bed with a slide out trundle that has drawers. Hopefully, it will be here soon. All those polka dots were cut on my Silhouette. They look so much better in person than they do in the photo. It's not as busy as it looks as all the other walls are just plain purple. I made that huge pink zebra pillow. It's a fuzzy fabric and it has pink sequins on it. It was so hard to stuff a 24x24 pillow into the opening but I did it. We were all amazed I got the pillow in such a small hole. This is the valance that my mom made. The curtains won't be pulled back this way. It was just to show the white polka dot pattern on the back. Faith picked all the fabrics and we used the pink pillow fabric in it too to pull it all together. 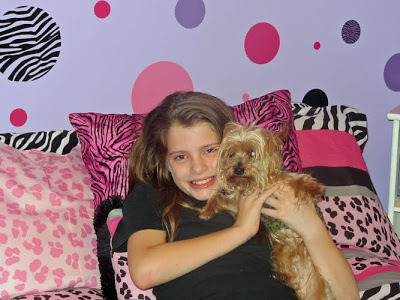 My girl with our little boy Squeaky. As happy as could be in her new, clean room! Let's hope she keeps it that way. Wow! What a fun room! 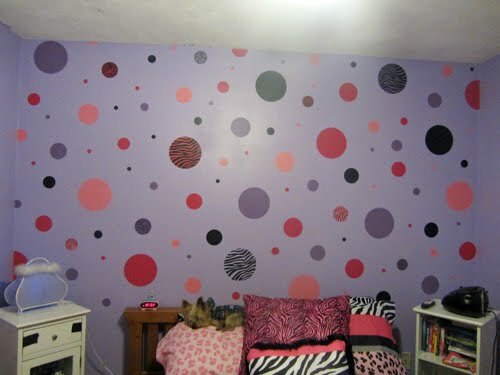 I love the purples, pinks, black and all the dots and texture! Love the big dots on the wall and the adorable door! Puppy posing on the bed shot is pretty adorbs too :) Good job mama!! !